As I mentioned in my last post, I was on vacation last week. It was our annual trip up to Pine Forest Lodge in Mercer, Wisconsin for a week at the cabin. This trip was different in that none of my extended family was able to make it up during the week we were up. While I missed having them around, it lent a different feel to the week in some cool kind of ways. Muskie fishing with Sarah on two separate mornings - just her and I. She has been asking for a while when we were going to go Muskie fishing again, so this was the perfect chance. I think I am incredibly blessed to have a daughter that loves to fish, but I think it's even more amazing that I have a daughter who is willing to learn how to throw a bait caster with heavy lures in an effort to catch one of the biggest freshwater fish in North America. She learned the technique almost without error and never complained once, this includes hoisting and dropping the anchor. 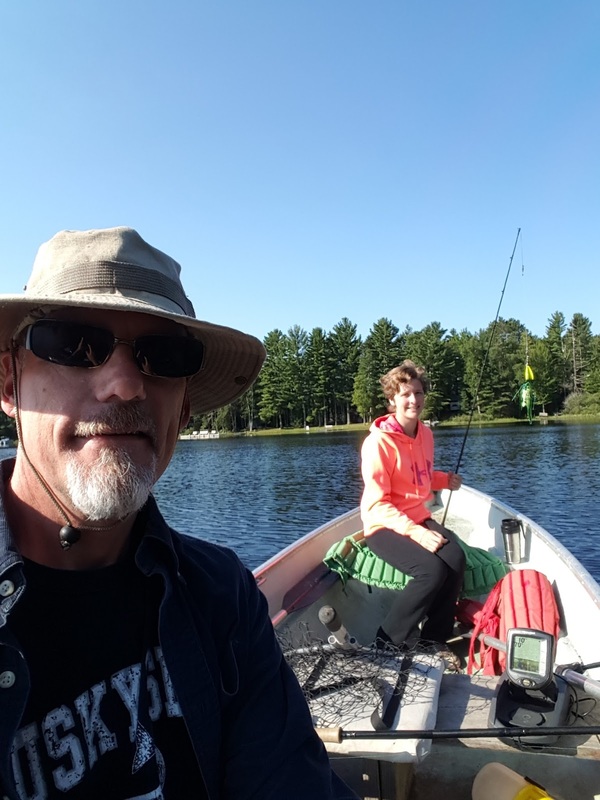 While we never caught a big muskie, I realized that there is a LOT to be said for spending time talking and laughing with my daughter in a boat on a calm morning in God's Country. The whole experience made me realize we did something right along the way in raising her. 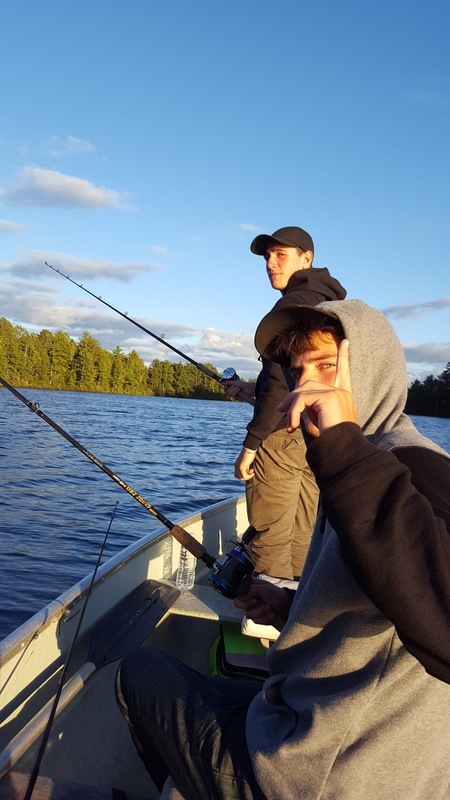 Fishing with Ben and his friend Van on a couple of evenings. Same deal here. Ben also learned how to cast the big lures with a bait caster without incident. Then, on the last night as we were fishing with a big "sucker" minnow, we had a big fish pull the bobber down. Unfortunately as I handed the rod to Ben, the fish spit the sucker out. We lamented our near-miss for a while and then got back to laughing, joking and enjoying each other's company. They cracked me up. One night around the fire, another couple we know broke out a guitar and started playing. Then another camper brought out a saw - yes, a wood saw - and started playing it with a bow. If you've never heard a saw, it is an eerie, cool sound. Combined with a guitar it made for some interesting arrangements. Before we knew it most of the people, including me and my son and his friend, were singing "Horse With No Name" and "Wish you were were here" around the fire with a guitar/saw accompaniment. It was spontaneous, imperfect art, and one of the coolest things I've been around in a while. 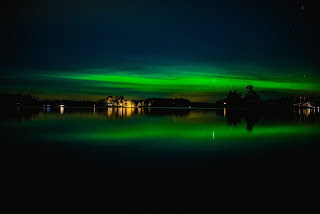 That same night we saw the distant northern lights. It was not the spectacular show we'd seen in past years, but was cool nonetheless. Stargazing every night was nothing short of breathtaking. Ben said it's almost like you could tell the earth was rotating if you watched the stars hard enough. I had to admit it was true. Throw into that mix a half a dozen shooting stars and they were nights to remember. We were part of a kayak trip that the resort owner set up. Every year he has a "wheelchair week" where his resort focuses on serving disabled adventurists. Near as I know he's one of the few resorts in the state that is committed to doing something like this and I think it is such an awesome thing. We packed seven kayaks into the back of a pickup and went out to a chain of lakes. At some points we were bushwhacking through bullrushes to make our way. It was an unexpected twist to an otherwise ordinary trip, but one I'm glad we ran into. I got to help a bunch of our friends' kids fish, kayak and pedal boat. There is nothing I like better than helping kids fish. If you've seen me in action, you know that I spend as much time baiting hooks, untangling lines and taking fish off as anything else, but it's all good. This is the next generation of adventurists/outdoor lovers, and I need to do my part. I enjoyed watching my two kids and Ben's friend interact with adults and carry on adult conversations with them. It made me so proud to see them be respectful, interested and engaged with other people and not the "sulking teenager" that you sometimes see at these types of venues. All of it made me realize that my kids are growing up fast. I hope they will want to come up again next year, but I know if they can't, we will all make it back up there someday. Pine Forest Lodge is a special place for all of us, and this trip was a reminder that as we all get older, it's important that we make time to be together in nature.